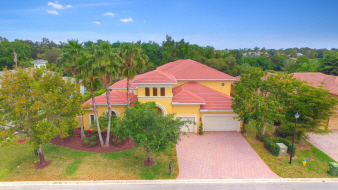 Superb 6 Bedroom, 5.5 Bath, courtyard pool home in the exclusive double-gated Enclave of Grand Palms, Pembroke Pines' premier golf resort community. Upgraded luxury touches throughout. Gourmet eat-in kitchen, wood cabinetry, granite counter tops, and stainless steel appliances including double wall oven. Impact windows, cathedral ceilings, marble floors, home theater system, summer kitchen, pool safety fence, gorgeous custom iron staircase. Spacious loft with built-ins/office. Private guest quarters with full bath overlooking the pool. On the Grand Palms Golf Course, walk to clubhouse w/restaurant, bar, hotel, fitness, tennis. Grade A Pembroke Pines schools. Close to I-75 for easy commute in every direction, extensive shopping, dinning, and entertainment options nearby.